I was talking to last week’s seminar speaker, and we were talking about Planet Hunters and some of the things that might be lurking in the Kepler data. One cool thought is there might be inverse transits so instead of dimming events, instead the star actually appears brighter. 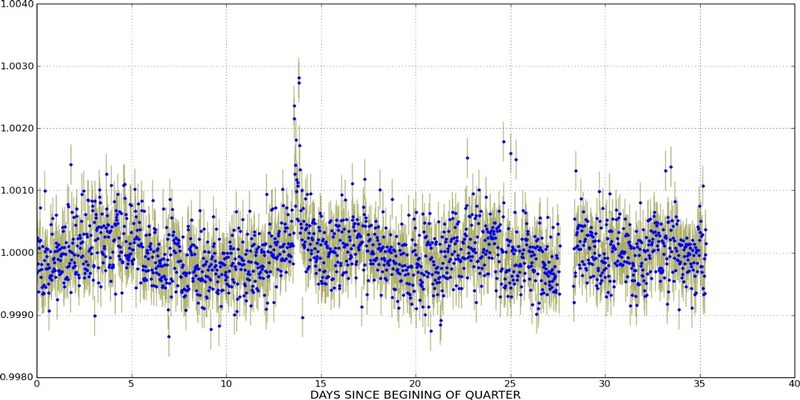 There are lots of eclipsing binaries that you’ve probably seen as you’ve been classified, but another interesting type of eclipsing binary might be a transiting white dwarf orbiting a main sequence star. White dwarfs are about the same size or a little bit bigger than the Earth about half as massive as the Sun. Depending on where the white dwarf orbits, there could be magnification causing a brightening as the white dwarf crosses in front it’s companion star. This magnification is caused by gravitational microlensing, where a massive object bends light of a background source resulting in images of the source that are magnified and distorted. 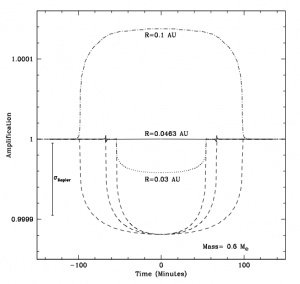 Transiting exoplanets are not massive enough to bend and distort the light of their companion stars significantly. For eclipsing binaries it looks white dwarfs are in the sweet spot, if they are orbiting extremely close to their partner main sequence star. 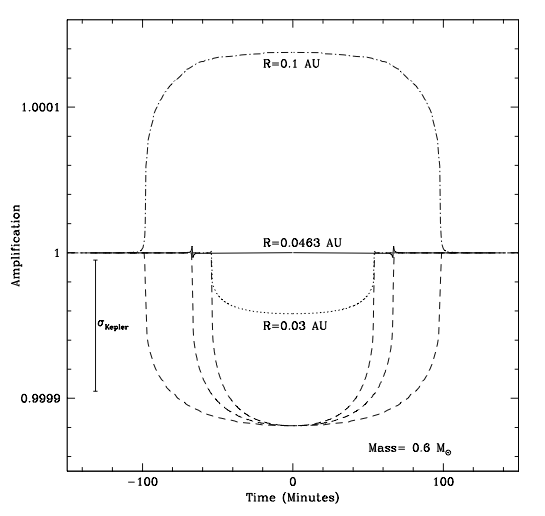 Papers in 2003 by Sahu and Gilliland (2003) and Farmer and Agol predicted that Kepler might be able to detect such events. In these cases during the transiting event, the ligthcurve gets brighter rather than fainter. 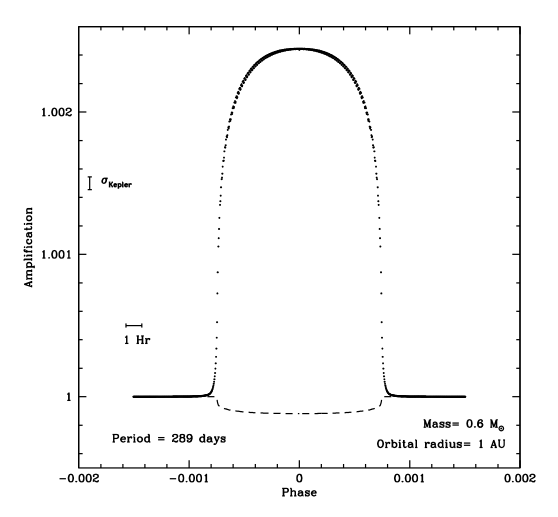 These events last as long as the transit does so only a few hours (if the white dwarf is orbiting at 1 AU the event is ~10 hours in duration). Here’s some examples from a paper by Sahu and Gilliland (2003) . There are some estimates of how many might be there ranging from a few to a about a hundred or so events in the Kepler monitored stars, but we really don’t know. No one has detected them, and there could be 1 or none but with so many eyeballs staring at the data, we might uncover them if they’re there. Anyone seen anything like this in the light curves you’ve classified? It would be very exciting if we found one, it would be the first such discovery – if you see an inverse transit like the examples above, please share on Talk and let us know about your discovery! First quarter. It rises and drops *extremely* quickly, to the point that I rather suspect it’s wonky data, but otherwise it fits your description. at the very beginning I remeber I saw something like this and I commented the star, but I don’t know how to recover this comment and therefore the star…. I found my lost star…. Thanks for searching for light curves for these things. 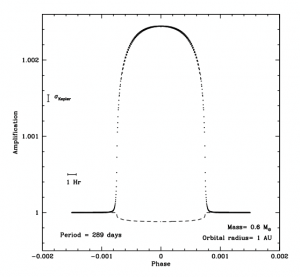 Would be interesting to watch a white dwarf transiting another white dwarf (I wonder if that would be possible).